When a loved one dies, you often feel overwhelmed, especially if it’s unexpected. Yet in the midst of your emotions and grief, you still have to plan a funeral or a memorial service. There is so much to do, from choosing a casket to picking out a cemetery plot. Yet, one of the most important things you need to do is take care of your loved one’s body. You have many options, from cremation to embalming. Dolan Funeral Home, the best funeral home in Chelmsford, Massachusetts, and serving the greater Lowell and Southern New Hampshire area, reviews your options for preparing your loved one’s body for visitation and burial. Contact us today! Immediately after death, the human body begins to decompose and return to the earth. This is necessary so the bodies of animals and humans don’t litter the earth. Many of these deaths sustain life for others, such as predators, scavengers, and even plants, as bodies are broken down to its natural elements by decomposers, which include flies, worms, bacteria, and fungi. The body’s cells begin to break down tissues, and bacteria does the same. Preparation for burial. If you are choosing a traditional burial for your loved one, the embalming process will be performed as soon as possible. You’ll need to pick out what you want your loved one buried in, and then your loved one will most likely be stored in a refrigerator, which helps with preservation. In the case of a traumatic death, autopsy, organ donation, or special services may be required for your loved one’s preservation of the body and for visitation services. Discuss these arrangements with your funeral home director as each case is unique. Preparation for cremation. If you are having your loved one cremated, embalming probably won’t be necessary, unless you needed to preserve the body for some other reason. In this case, your loved one can go straight to the crematorium. However, if you want a visitation where your loved one will be displayed, the body will most likely need to be embalmed ahead of time and then transported to the crematorium. Preparation for visitation. After the embalming process is complete, you’ll pick out the casket for your loved one to be buried or displayed in, a date arranged with the funeral home for service, and an announcement of the service either in the local newspaper or on the funeral home’s website. These days there are many options available for visitation. For example, Dolan funeral home offers catering for your funeral reception and help with the coordination of the services and arranging of a clergyman and cemetery. We’ll recommend wonderful florists in the area and take care of the flower arranging. We also offer computer ports for your PowerPoint presentations during the memorial services. We have a piano for live music or a great sound system for soothing background play. Preparation for donating to science. Usually, if your loved one requested his or her body to be donated to science, it won’t be embalmed. Often, these bodies go to medical schools for students to dissect, but some go to other research facilities for practice in robotic or arthroscopic surgery, heart valve transplants, administering anesthetics, testing for experimental treatments such as laser treatments for acne, or even to first responders to use when practicing life-saving techniques. In these cases, the body is usually preserved in refrigeration until it can be transported to the medical facility. If you do desire a viewing, a funeral home such as Dolan Funeral Home will do everything possible to expedite the process. Preparation for transportation to another state. Sometimes your loved one dies away from home. In this case after the pronouncement of death has been made, you’ll have to arrange for your loved one to be transported home to your funeral home of choice. Depending on circumstances of the death (such as suspicion or accidental, which may require an autopsy), the body will usually not be embalmed before transportation (only three states (Alabama, Alaska, and New Jersey) require embalming when crossing state lines). It’s best to call the receiving funeral home, which usually have protocol in place and providers to transport your loved one’s remains. It is possible to transport the body yourself, which would save a considerable amount of money. Most funeral homes include cosmetics and hair dressing of your loved one in the embalming process. Restorative work when an accident has occurred is usually a separate charge, as well as in the case of an autopsy. Dolan Funeral Home proudly serves Chelmsford, North Chelmsford, Tyngsboro, Westford, Dunstable, Dracut, Lowell, MA, and Hudson, NH. We understand when a loved one dies how hard it can be to plan and manage a visitation and then a subsequent burial. 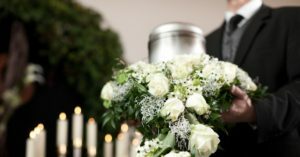 Dolan Funeral Home offers pre-arrangement services, where you can make many of the funeral home decisions ahead of time to avoid making hasty decisions or forgetting something important, like the placing of a favorite item in your loved one’s casket. These are tentative plans and often times, just thinking about funeral arrangements ahead of time is enough to relieve some of the stress after your loved one has passed. Dolan Funeral Home also offers up help with purchasing a memorial plot in a cemetery as well as advice on tombstones. Our funeral home services don’t end with the burial of your loved one either. We provide compassionate aftercare services as well, free for the first year after your loved one’s passing. We can help you with grief, including recommending excellent local counselors in the area. We’ll help you sort through paperwork, answer any questions you may have about the legal process of death, and be a resource for you. We offer memorial ornaments, help with condolences and eulogies, memorial jewelry, and prayer books. Dolan Funeral Home in Chelmsford is passionate about caring for your loved one after death as well as helping the living cope. Contact us today for all your funeral home needs!